Hallelujah on April 23rd, 2017 KPPI team served in Pasirido Village, Manokwari District, West Papua. Praise and Divine Healing Service was conducted at GPIB Bethlehem, Pasirido which is grazed by Rev. Peter Maniburi. The crusade was opened in a prayer led by Rev. Selly Kafiar. Followed then by praise where the worship leader invited congregations to praise and worship God with joy. After that airing a film of healing testimony. The preaching of the Word was delivered by Rev. Richard Nadapdap, from KPPI team of Jakarta, taken from Mark 4:35-41 about Jesus abated the wind storm. God’s servant said that we often complain to God when problems, sickness, and heavy burden come in our lives. But God knows what really happens. Therefore, do not be afraid because the Lord Jesus is in the boat with us. When God’s servant requested the congregations to believe in the Lord Jesus, then almost all congregations wanted to trust in the Lord Jesus as the Lord and Savior in their lives. The Word of God was continued by Rev. Jemima Dina, Jakarta KPPI team who delivered from Matthew 15:21-28, about a woman of Canaan who believed. Where this woman believed that God would heal her daughter. Although rejected by God but she still trusted that the Lord Jesus was able to heal. During healing prayer the sick congregations came forward to be prayed by God’s servants and counselors. Praise God that evening God healed various illnesses, from eye pain, where his eyes could not see for years, gastric pain, abdominal pain, and other diseases God healed as well. That evening there were also servants of God, they were Rev. Pieter Maniburi from GPdI Bethlehem, Rev. 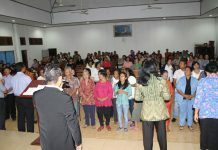 Mofu from GBI Talitakum, and Rev. Sally Kafiar from GBI Efata. 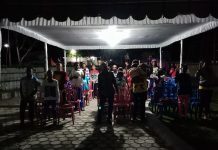 The whole congregations rejoiced to see what God had already done in Pasirido Village of Manokwari District, West Papua.